We may have the solution you are looking for to help improve your smile and confidence. Dental implants are becoming the most popular natural looking, permanent alternative to dentures and bridges. At Dental Solutions we are happy to help with advice. We will offer advice and our opinion on all options available to you. As dental implants are only available via consultation with a qualified dentist, we will refer you to a recommended qualified Dentist / Implant surgeon who will be only too happy to see if you are a suitable candidate to have dental Implants. As a team we will co-ordinate your appointments so that everything goes smoothly from the beginning to the end of your treatment. Implants are basically a titanium metal rod which is inserted into the jaw bone. It is then used to support one or more false teeth, which is the ‘dental implant’. Implants are permanent and you can have any number of teeth replaced, from one single tooth to a complete set. Dental implants are suitable for most people and can be used to replace missing or natural teeth. For the denture wearer, dental implants will put an end to loose or poor fitting dentures. If you are unhappy wearing dentures and want to feel more confident when talking and eating or have difficulty keeping them stable, then this type of treatment could be for you. You may find that wearing unsecured dentures makes you feel awkward and is inconvenient to the lifestyle you lead. There is a variety of dental implant based tooth replacement solutions available. Implant dentures provide stability where new teeth are attached to two or more dental implants, making this a cost effective option. You can chew with confidence a variety of foods and your sense of taste is unaffected. Your teeth can be removed for cleaning and there is NO need for denture adhesives. Dentures on an implant bar for an even more secure fit, a dental bar is fixed to your jaw bone with two more implants, providing stronger support for your removable dentures. Your new teeth can be removed for cleaning and again there is NO need for adhesives. 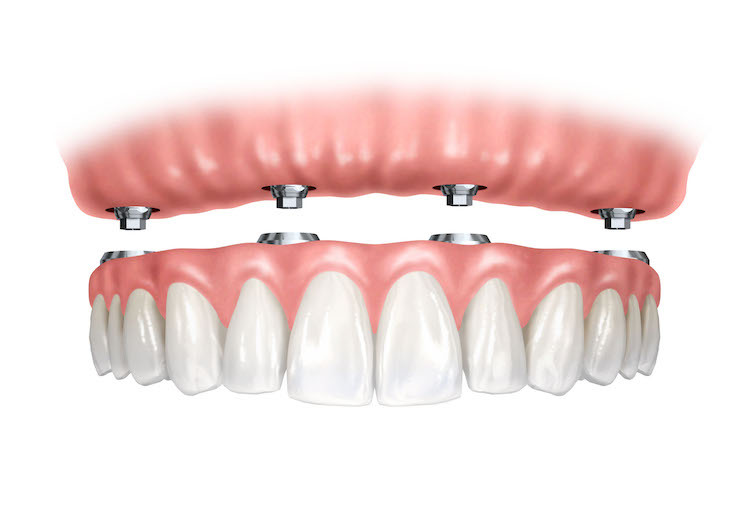 Fixed implant supported bridge or Hybrid bridge a more durable solution with natural looking replacement teeth, secured on four or more dental implants. This solution stimulates bone maintenance, restores chewing function and maintains taste sensation. For an informal chat call us on 0151 6789833 .